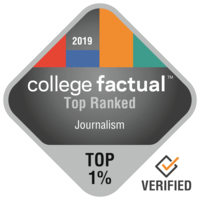 2019 Best Journalism Colleges in the U.S. There are approximately 13,890 students graduating with a degree in Journalism every year. This helps make it 38th most in-demand from the 384 total college majors we have data on. Journalism is ranked 87 out of 121 college majors for graduate pay. This means it is around the low end for salary potential, but you can improve your chances of a high-paying career by finding a superior school and pursuing an advanced degree. Learn about the top ranked colleges and universities for Journalism majors. Some of the factors included in the ranking methodology include education quality, average earnings of graduates, accreditation, and more. The best school in the United States for Journalism is Emerson College. Soon after graduation, journalism students generally make about $41,745 in their early careers. Boston, Massachusetts is an appropriate surrounding for young people who appreciate the fast moving city life. Any student pursuing a degree in Journalism has to check out The University of Texas at Austin. The University of Texas at Austin offers graduate degrees in journalism for those interested in an advanced degree. The University of Texas at Austin is among the largest schools in Texas. Every additional year of college causes students to take on more debt, so UT Austin's impressive 55.1% graduation rate is definitely a plus. For students who wish to carry on after earning a bachelor's degree, The University of Texas at Austin has graduate programs available. In what areas is UT Austin doing the best? Check out all the school's rankings. University of Missouri - Columbia is among your top options if you're planning on studying Journalism. University of Missouri - Columbia offers graduate degrees in journalism for those interested in an advanced degree. Looking for a big school? This college has more than 20,000 students on campus. With the diverse population at Mizzou, you'll have lots of opportunities to learn from individuals from many walks of life. With a low price and fantastic academic programs, University of Missouri - Columbia is a fantastic value, earning a position of #3 in Missouri. Get a better idea of what student life at Mizzou is like by viewing some campus videos. It's hard to find a better school than Northwestern University if you wish to study Journalism. In addition to its bachelor's programs, Northwestern University offers graduate degrees in Journalism. Northwestern University has one of the largest student bodies in Illinois. Student success after graduation is significant at Northwestern University, and graduates typically leave the university with total debt far lower than the national average. Score higher than 33 on the ACT? That's above the average applicant score, so you have a good chance of getting in. Learn more about what campus life at Northwestern U is really like by seeing a few campus videos. New York University is a good choice for individuals interested in a Journalism major. New York University offers graduate degrees in journalism for those interested in an advanced degree. The location in a major city is great for scholars trying to find adequate opportunities for social networking, adventure, and exploration. It is difficult to beat Boston University if you want to pursue Journalism as a major. Boston University offers graduate degrees in journalism for those interested in an advanced degree. Looking for a big school? This institution has more than 20,000 students on campus. If you're interested in Boston U, better study hard. The usual SAT score of applicants is 1,320. Boston U has been rated among the best for education quality for veterans and active-duty military. The scorecard provides a good summary of Boston U. Any student pursuing a degree in Journalism needs to look into University of Maryland - College Park. University of Maryland - College Park offers graduate degrees in journalism for those interested in an advanced degree. Positioned in College Park, Maryland, UMCP offers a dependable, suburban environment for young people. George Washington University is a good decision for students pursuing a Journalism degree. After getting their bachelor's degree, journalism students typically earn around $41,692 in their early careers. Washington, District of Columbia is an excellent setting for college students who get pleasure from the active city life. Graduates of this school generally don't have difficulties paying off their student loans; just 1.8% are in default. If you're considering GWU, better study hard. The typical SAT score of applicants is 1,288. Find all of George Washington University's rankings to learn more. It's hard to beat University of Southern California if you wish to pursue Journalism as a major. In addition to its bachelor's programs, University of Southern California offers graduate degrees in Journalism. University of Southern California is one of the largest schools in California. Any student pursuing a degree in Journalism needs to take a look at Northeastern University. Northeastern University offers graduate degrees in journalism for those interested in an advanced degree. The setting in a main urban center is tremendous for scholars seeking out considerable options for social networking, excitement, and life. This school attracts the very best, and the average SAT score of applicants is typically around 1,420. You'll get to meet others from many different nationalities because of Northeastern's diverse campus. View a few school videos to discover what is happening on campus.